Globe launches the pre-registration portal of the heavily-lauded iPhone 6 and iPhone 6 Plus in preparation for its massive release in the country weeks from now. The company marks the first telco to open a registration of interest for the iPhone 6 and iPhone 6 Plus to the Philippines in its pre-registration page. 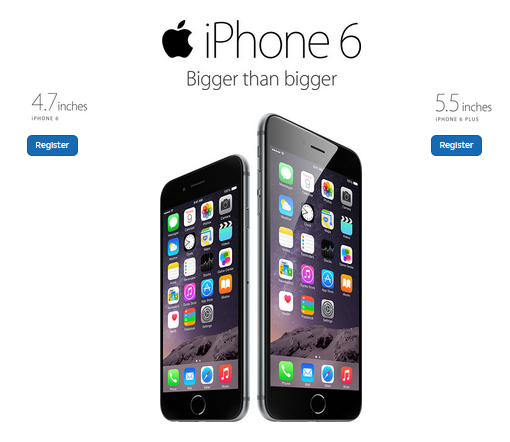 The portal allows customers to signify their interest to get the iPhone 6 or iPhone 6 Plus from Globe. Check out the page by clicking here. Once in the portal, both new and existing will be directed to choose what iPhone that suits them including the hues (Gold, Space Gray and Silver) and the capacity (16GB, 64GB and 128GB). Afterwards, prospective buyers could key in their information for them to receive updates for the newest iPhone 6 and iPhone 6 Plus. Globe was the exclusive telco to have the iPhone in their network until 2011 with the release of the iPhone 4s along with the smartphone boom in the country. The release of both iPhone 6 and iPhone 6 Plus is expected to be on the week November 15 or 16, same time-frame when we have iPhone 5s/5c last year.